Tracks 1-4,7,9,11: Paul Moran (B3, trumpet, flugel); Nigel Price (guitar); Laurence Cottle (bass guitar); Mez Clough (drums); Michael Osbourne (perc.). Tracks 5,6,8,10: Paul Moran (B3, bass pedal); Jim Mullen (guitar); Adam Roman (drums); Jeff Scantlebury (perc.). 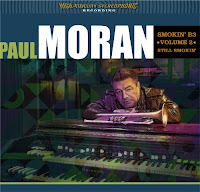 Twenty years on from Paul Moran's debut album - Smokin' B3 - up comes volume 2 - Still Smokin'. After hearing volume 1, Jimmy McGriff called Paul "The Real Deal". This follow-up would do nothing to change his opinion! If anything, it would have had the late legend searching for even greater superlatives. 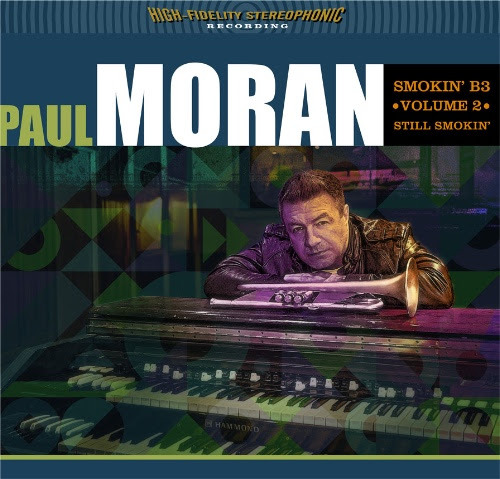 A program of '60s pop hits, Moran originals and a couple of standards make for a varied selection all of which fall easily into the hands of our smokin' gun who makes them his own which, in actual fact, four of them already are! Think McDuff, McGriff, Groove Holmes, Jimmy Smith and you'll find Paul Moran being ranked alongside them. Add guitarists Price or Mullen, close your eyes and you're in a bar on the south side and I don't mean South Shields where Paul's talent first showed and where his father, Tommy Moran, is still a highly respected organist/sax/clarinet player. Paul also plays trumpet and flugel and I think it is on the latter instrument that he can be heard on his own Scallywag. Trumpet can be heard tightly muted on another one of his own pieces - Fried Chicken. This is perhaps the track of the album. The one where he goes for the knockout and gets it with two tracks to spare! The album is launched at the 606 in London on April 18. 1: Come Together, 2: Scallywag, 3: Moments, 4: One Note Samba, 5: Have You Seen Her? 6: Work Song, 7: Ruby Blues, 8: Blueberry Hill, 9: Fried Chicken, 10: Working in a Coal Mine, :11 Where or When.